SANCTUARY roared out of the depths of the Seattle metal scene with lightning speed guitars, a pounding rhythm section and a voice that broke sound barriers. The band’s debut album, Refuge Denied, was released in 1987 and boasted production by MEGADETH’s Dave Mustaine. The album garnered positive reviews from metal press and their shows were heavily attended both in the United States and abroad. 1990’s Into The Mirror Black pushed the band even farther toward success and the music was lauded by critics as being the best metal offering of the year. SANCTUARY was poised for greatness and they gathered a loyal following of fans worldwide before their demise in the early 1990’s. 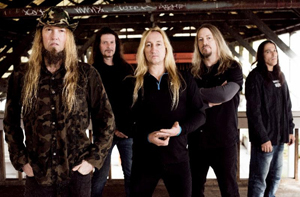 However, vocalist Warrel Dane, bassist Jim Sheppard, guitarists Lenny Rutledge and Sean Blosl, and drummer Dave Budbill were never far from the most avid fan’s mind and there was always hope that they would reunite. Songs like “Battle Angels”, “Veil Of Disguise”, “Die For My Sins”, “Future Tense”, “Eden Lies Obscured” and “The Mirror Black” remained fan favorites and in the late 90’s and early 2000’s, when Dane and Sheppard were touring with their band NEVERMORE, the occasional SANCTUARY song would be showcased because of fan demand. 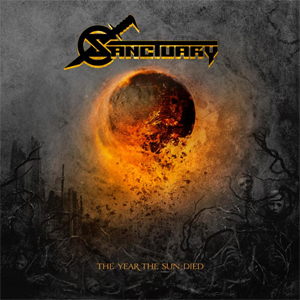 Much to the joy of the metal world, SANCTUARY has resurfaced and has finished up what may be the most critically acclaimed release of 2014. The band is strong and ready to tour. However, Blosl decided not to join the endeavor and has been replaced by guitarist Brad Hull, and now the band is poised to release their first album in 25 years. The Year The Sun Died boasts eleven tracks of pure metal that has a conceptual theme. The cover art by Travis Smith is extravagant and follows the format of the music. He goes on to explain that the concept of the record is blended in with introductions to the songs and definitions in the liner notes; a notion very similar to what NEVERMORE did with Dreaming Neon Black. He also says that working together as a band again has been evolutionary for SANCTUARY. The album was recorded in Seattle with well-known producer Zeuss. 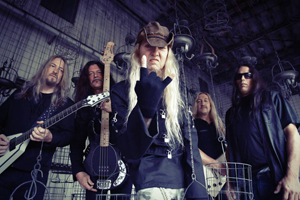 While his work over the past few years has been with rather different genres of metal, he brought his unique approach into the studio and Dane says that it brought the band together as a unit. The band recently went to Germany to perform at an array of festivals and to shoot the video for the tune “Frozen”. The video will debut online on September 23rd, and the album release will be on October 14th in the United States. Tour plans are in the works and some shows have already been scheduled. With that said, check out the album track listing. SANCTUARY can be seen live at the below dates. Also, check out the stream of “Arise And Purify” below while we await the album release. "Let The Serpent Follow Me"
"Exitium (Anthem Of The Living)"
"One Final Day (Sworn To Believe)"
"The Year The Sun Died"